We all know that Kentucky is home to an endless array of aboveground attractions. 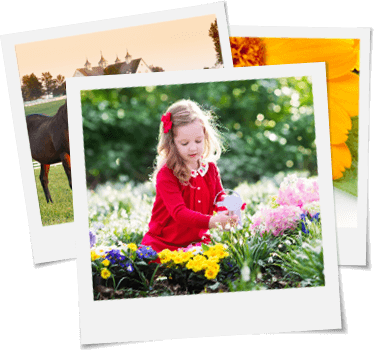 But did you know our state features many exciting belowground destinations, too? Get ready to explore areas of the commonwealth that can be seen only beneath the depths of the Earth’s surface. Your subterranean adventure starts now. Whether you’re a fan of bourbon or of history, the famously nicknamed Bourbon Pompeii Tour at Buffalo Trace Distillery offers a unique way to experience the Frankfort site’s rich bourbon heritage. It started in 2016 while renovations were being made to its Old Fire Copper Building to expand event space. While shoring up the foundation, workers hit a wall—literally. “That’s when we altered our plans, enlisted the help of a bourbon archaeologist, and immediately began working to excavate and preserve this piece of distillery history,” says Kristie Wooldridge, public relations associate manager. They’d discovered what was dubbed Bourbon Pompeii, the 19th-century distilling site of Colonel E.H. Taylor Jr., the man who revolutionized the bourbon industry. Unearthed were the original foundation wall Taylor built in 1869, a second foundation built by Taylor in 1873 and Taylor’s intact fermenting vats dating to 1883. The Bourbon Pompeii Tour—E.H. Taylor Tour is its official name— enables visitors to delve deep into the layers of bourbon history, while exploring a rare archaeological distilling site. Most recently, one of the fermenters inside the Old Fire Copper Building was restored. The top of the fermenter was lined with bricks found when excavating the space, and it was relined with copper, just as it would have been during Taylor’s tenure. This past January, the distillery recommissioned the fermenter by filling it with old-fashioned sour mash for the first time in 100 years. 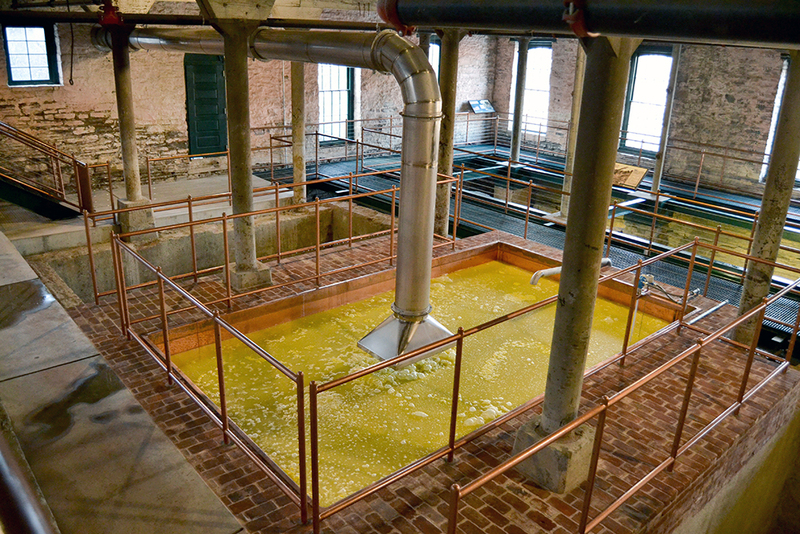 In the future, Buffalo Trace plans to use the upper levels of the building as event space, providing another unique view of the recently recommissioned fermenter. “Louisville Mega Cavern is not like anything you can imagine until you’re here seeing it in person,” says Sarah Harris, director of group sales and events. This 100-acre limestone cavern has over 17 miles of passageways stretching beneath all 10 lanes of the Watterson Expressway and a large portion of the Louisville Zoo. Classified as a building, it is the largest in the commonwealth and is home to a fun-derground adventure park featuring attractions for all ages. Gear up for Mega Zips, the world’s only underground zip-line course. This exhilarating, one-of-a-kind thrill ride features six zip lines, including a dual-racing zip and two challenge bridges. 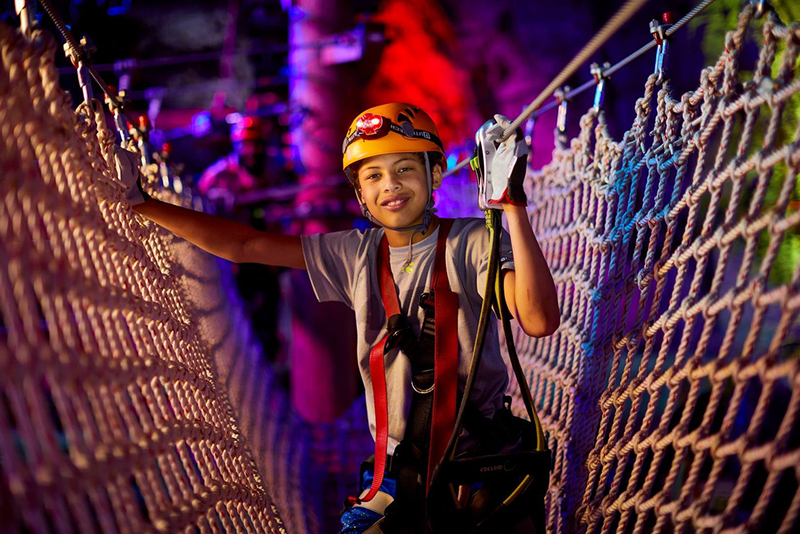 Or navigate your way through Mega Quest, the planet’s only fully belowground aerial ropes challenge course. Mega Bikes is an underground bike park boasting over 45 trails, jump lines, a dual slalom and more. The guided Electric Bike Tour offers groups of five to seven a more intimate view of the cavern. “You get off your bike and look at things up-close and personal,” says Harris. For a slower pace, board the Mega Tram to view unique items found inside the cavern. “We were supposed to be a fallout shelter during the Cuban Missile Crisis,” explains Harris. “We have a civil defense unit in our tram tour that has kind of a mock bunker set-up.” Had the worst happened, approximately 50,000 Kentuckians were on an approved list to dwell inside the cavern. Included on that list? Kentucky Fried Chicken’s Colonel Harland Sanders. Visitors also glimpse mountains of salt—the supply for Metro Louisville and the back-up supply for the entire state are stored there. At 58 degrees, Louisville Mega Cavern is an ideal year-round destination for families and school field trips. Multiple new attractions are planned for 2019, Harris says. Pennyroyal Scuba Center Blue Springs Resort Inc. 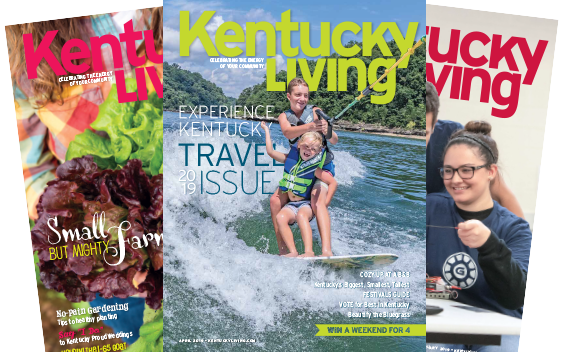 This year marks a milestone for Pennyroyal Scuba Center Blue Springs Resort Inc. in Hopkinsville—the season that opens April 13 represents its 25th year in business. Since 1994, father and son diving duo Dennis and Kris Tapp, who co-own the business, have been introducing visitors to unforgettable underwater adventures. “We have actually grown into a full-service diving destination,” Kris Tapp says. 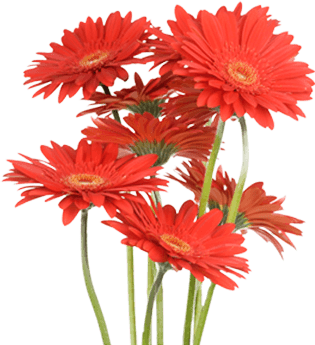 Visitors find everything from scuba diving classes to certification courses, and equipment sales and service. Tapp estimates the center hosts 7,000-8,000 visitors each season. Among the Pennyroyal Scuba-certified divers are Tennessee Titans football players, county music artists and former Vice President Al Gore. The 22-acre facility boasts depths ranging from 4 to 120 feet at the quarry’s deepest point. Underwater, divers can explore items like a 1940s school bus, a 1941 Dodge fire truck, an RV and a yacht totaled by Hurricane Katrina in 2005. Divers also encounter dinosaur skeleton replicas, including a 9-foot-tall Tyrannosaurus rex. 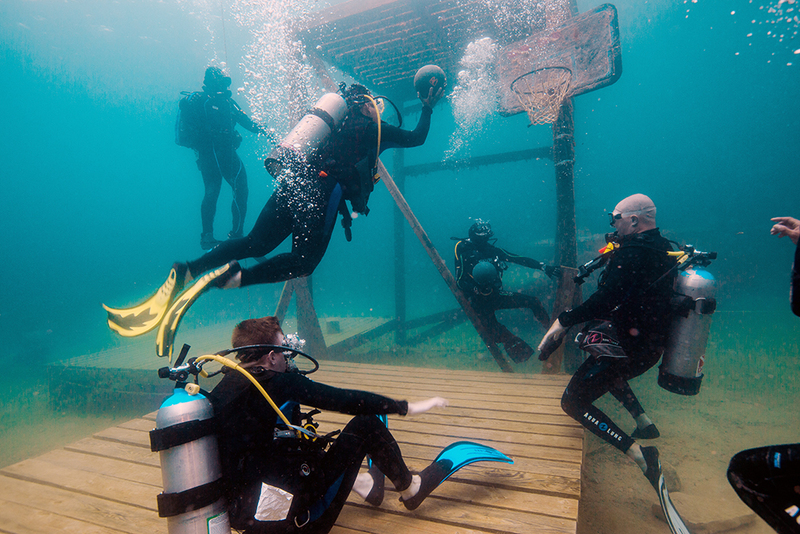 Want to shoot underwater hoops? Pennyroyal Scuba offers that, too. To sink a basket, players use bowling balls. “It’s a little harder than it sounds,” Tapp says with a laugh. Descend below the Earth’s surface to discover the underground world of Thrillsville Adventure Park in Slade, site of an 1800s limestone mine. 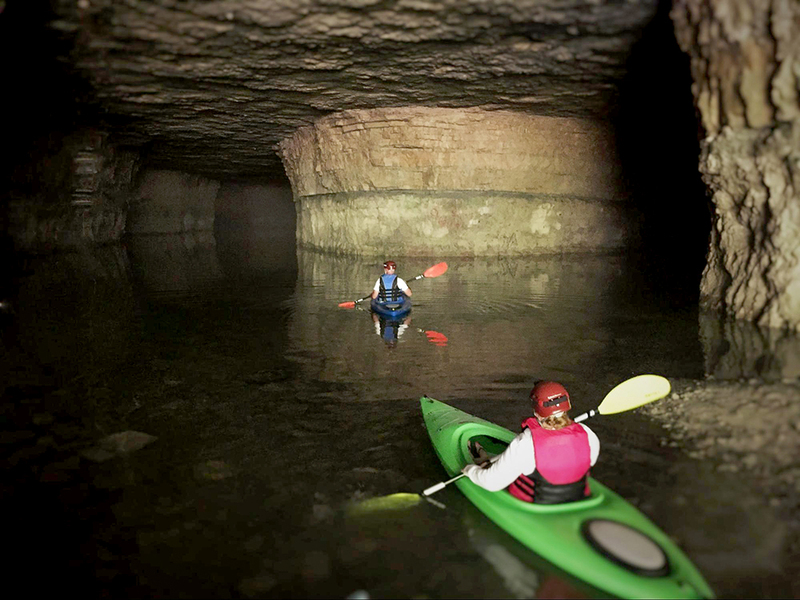 It’s no ordinary spelunking trip—instead of hiking, thrillseekers explore a massive cave by kayak or by boat. “In 1981, they blasted in there and hit a big spring, and it started filling up,” office manager Wendy Blasdell explains. Attempts to pump out the water, ranging from 10 to 40 feet deep, proved futile. So, a couple of years ago, owner Ian Teal opened The Gorge Underground to visitors. The family-friendly boat tour accommodates up to 20 passengers for an hourlong ride. Knowledgeable guides maneuver along the way, pointing out interesting formations and leftover mining equipment, still visible underwater. If you look carefully, you may spot newly relocated rainbow trout swimming alongside the boat. Blasdell reassures those leery of tight spaces that the cave is “big enough that you don’t feel like you’re smothered in.” But be prepared to experience total darkness once the guides instruct everyone to turn off their lighted helmets.